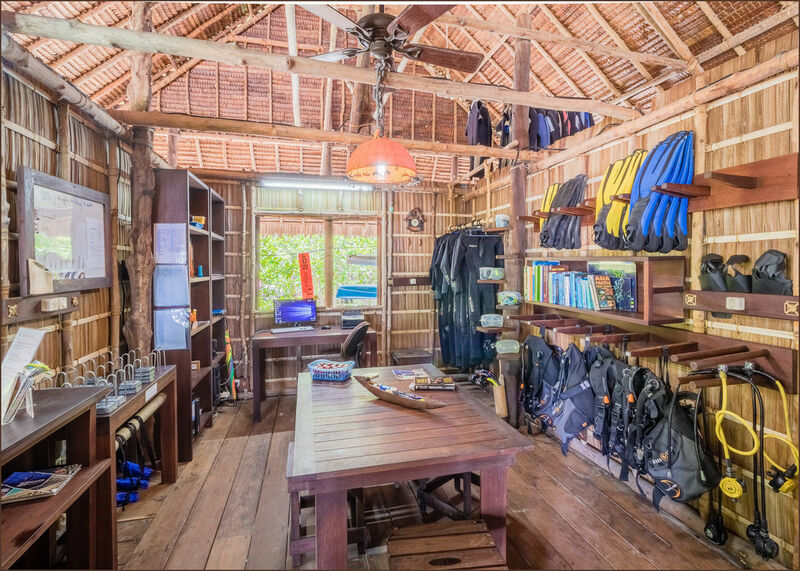 The Dive Center is managed by Arif backed by several qualified local dive guides with sunny personalities and infectious laugh. 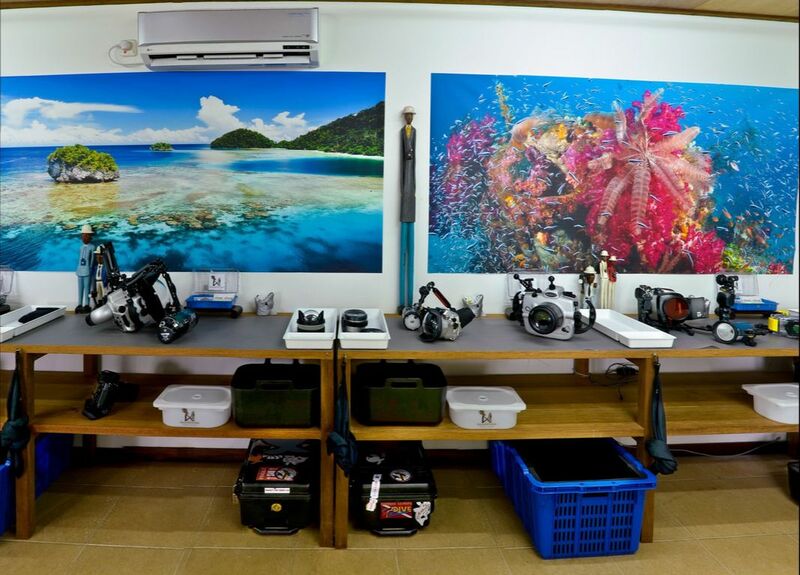 ​Rental gear is available, as well as a library of marine reference guides. gear is stored at the end of the jetty for the duration of the trip, where also dive briefings are held and the dive boats are docked. 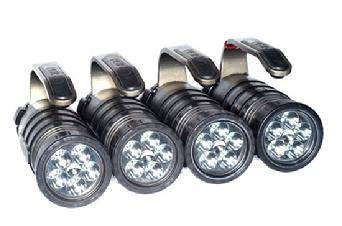 ​​Photographers are welcome to use the air-conditioned camera room for storage and set-up of their imaging gear. 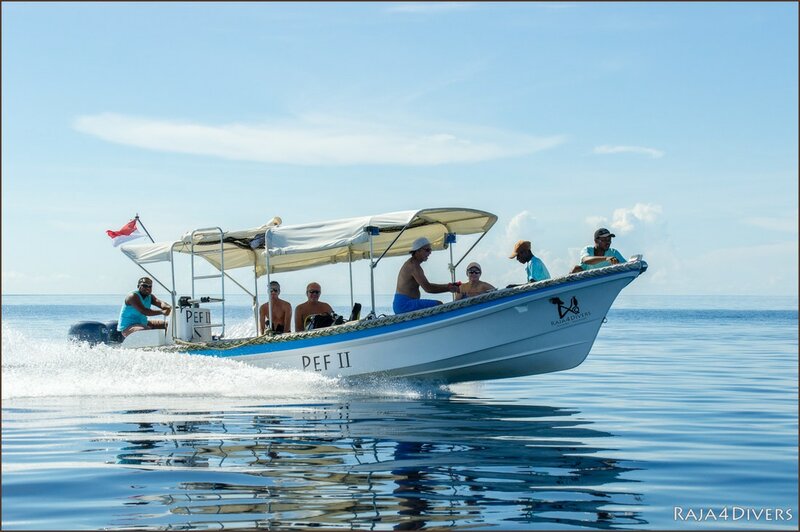 ​The ​3 dive boats, ​Pef II, Pef III and Pef IV have quiet and fuel efficient twin Yamaha 50hp 4-stroke outboard motors, built-in shade protection and have been custom fitted to maximum space and comfort, offering a maximum of eight divers per boat. 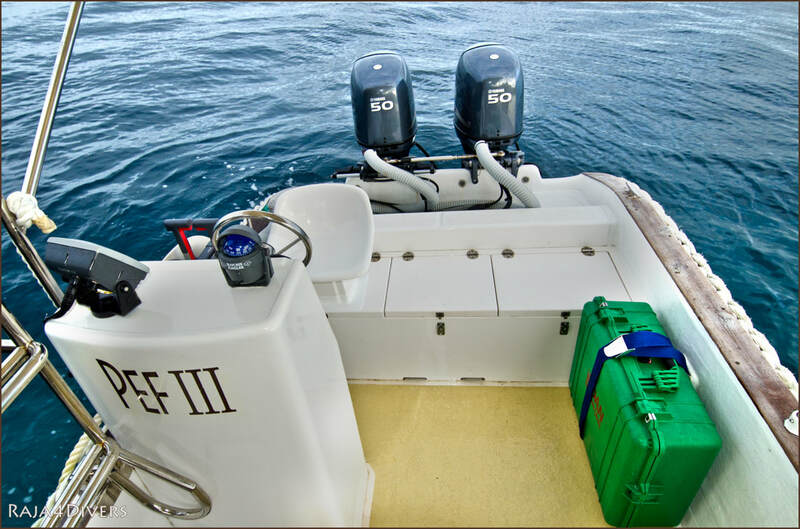 Each dive boat is equipped with standard safety equipment as First Aid kit, First Aid Oxygen, tools, compass and 2-way radio, as well as dedicated padded camera crates, drinking water and towels on all trips. 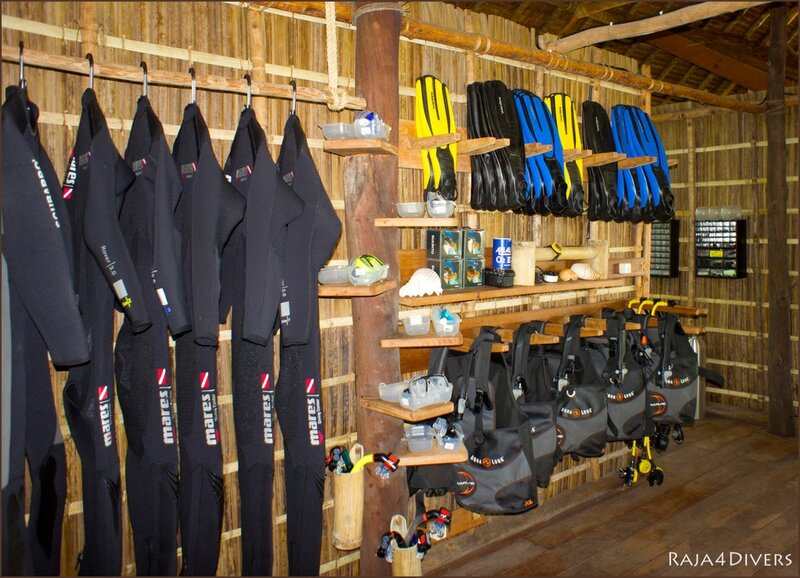 In order to maximize comfort and convenience, divers and snorkelers are urged to bring their own soft-gear: wetsuit, mask, snorkel and fins. 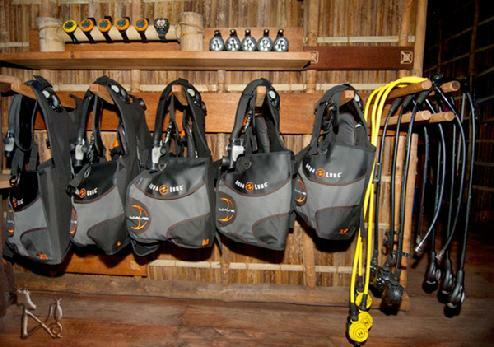 Limited rental gear is available: BCD, regulator, dive computer and dive light. In order to avoid disappointment, simply book at least 60 days in advance. We have 9 and 11.1 liter Aluminium tanks with DIN​ Valves or INT adapters. Please note: adapters are provided, it is not necessary to bring your own. We have Aqualung Wave Jackets in size XS, S, M, L, XL and Aqualung Calypso Titan Regulatosr with Octopus. The Dive operation is equipped with a Bauer Mariner 320-E and a Bauer M250B compressor, as well as a Nitrox membrane system. ​The use of Nitrox 32% (Enriched Air) is encouraged and offered free of charge. A Nitrox certification is required. In order to become Nitrox certified, simply ask about completing the course. 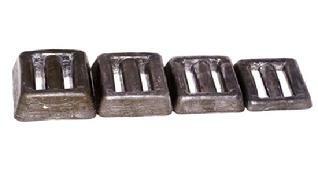 Nitrox is air that has been enriched with Oxygen, in order to lower Nitrogen levels. 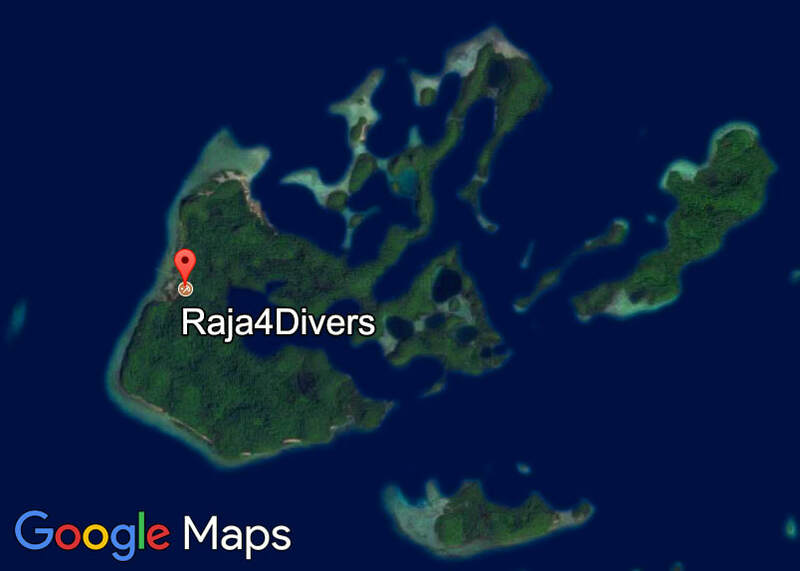 ​Please be aware that there is NO Hyperbaric Chamber in West Papua (Raja Ampat).